Failing in the early years of basic education can not be mitigated by adding years at the end of high school. In contrast, adding years at the beginning just might. There is, however, no guarantee. The idea behind providing formal schooling to young learners comes with the hope of preparing children for basic education. In the United States, children are introduced to a school setting before they reach five years old to equip them with skills necessary for kindergarten. 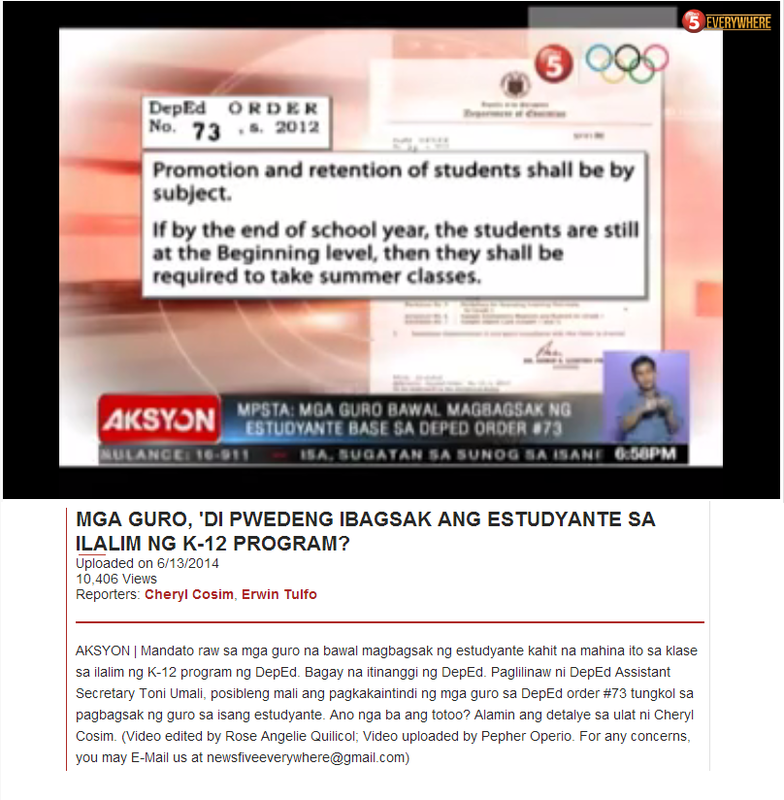 In the Philippines, DepEd's K to 12 introduces the mandatory kindergarten year as a dry run for the elementary years. On the surface, preparatory school is sound. And there is evidence that early child education helps. However, as with other education reforms, success is not guaranteed. Simply adding years to basic education, even in the early years, does not necessarily mean better learning outcomes. A research report recently released last month by researchers from Vanderbilt University is certainly an eye-opener. From the title of the study, it can be easily inferred that this is a longitudinal study following a cohort of preschoolers through third grade. The children in this study are divided into two groups: Those who participated in Tennessee's Voluntary Prekindergarten program (TN-VPK) and those who did not. Lipsey, M. W., Farran, D.C., & Hofer, K. G., (2015). 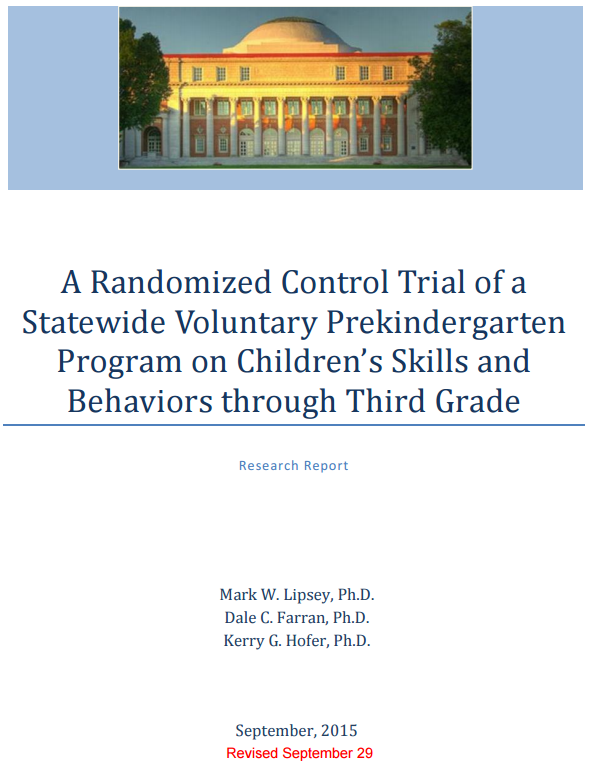 A Randomized Control Trial of the Effects of a Statewide Voluntary Prekindergarten Program on Children’s Skills and Behaviors through Third Grade (Research Report). Nashville, TN: Vanderbilt University, Peabody Research Institute. Throughout the study, the children have been assessed for both cognitive (literacy and math) and noncognitive (social behavior and work-related skills) outcomes. The results on cognitive measures are summarized in the following figure. The test, Woodcock Johnson III Achievement Battery (WJ), includes Letter‐Word Identification, Spelling, Language Oral Comprehension, Picture Vocabulary, Math Applied Problems, and Quantitative Concepts. The WJ Composite6 score (plotted in the above figure) is an average over these six tests. Clearly, children who were enrolled in preschool had an advantage over those who did not in kindergarten (age 5), but this advantage quickly diminished in the later years of primary schooling. 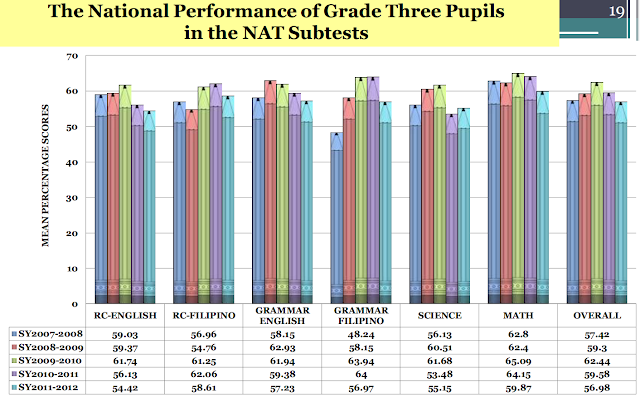 In fact, by second and third grade, those who did not attend preschool are already outperforming those who did. Results from non-cognitive measures also show a similar trend, demonstrating that preschoolers have an advantage over non preschoolers in social behavior and skills, but this difference likewise disappears by third grade. 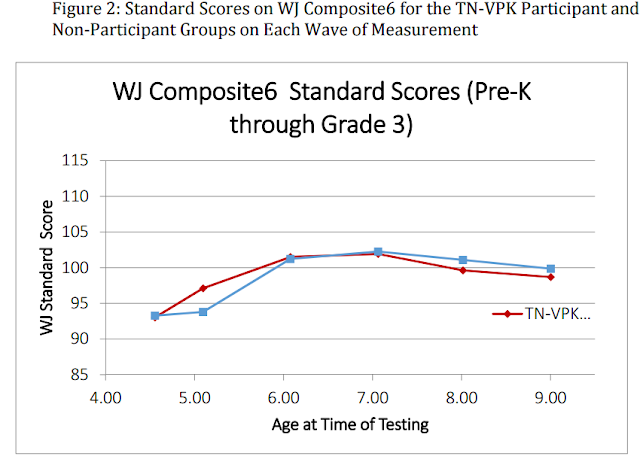 The Tennessee Voluntary Pre-K (TN VPK) program is recognized as a national leader in pre-K quality, achieving 9 out of 10 quality standard benchmarks of the National Institute for Early Education Research (NIEER), only 4 states achieved 10 quality standard benchmarks in 2012. Disadvantaged children who receive quality early childhood development have much better education, employment, social and health outcomes as adults, the vast majority of research shows. Unfortunately, this good news is getting lost in the current obsession over third-grade test scores. 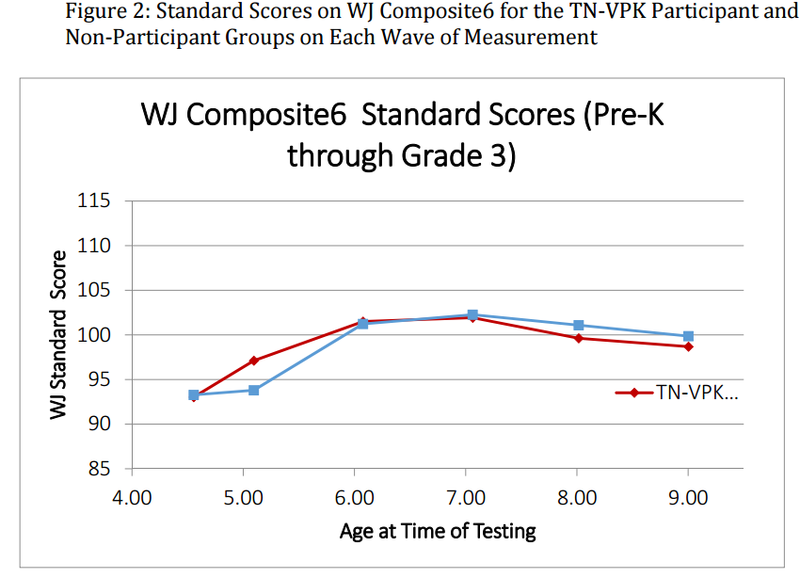 This is the case with the recent debate around the new Vanderbilt study on the Tennessee pre-K program. Heckman's contention is that the positive effects of a quality preschool program does not really manifest until later in life. These are seen in measures like higher earnings, were more likely to hold a job, had committed fewer crimes, and were more likely to have graduated from high school. The Vanderbilt study, however, does not refute these past findings, in my opinion. What the study perhaps points out is that basic education really needs to be a sustained effort. In order to bring to fruition the potential effects of a preschool education, the later years, in this case, kindergarten through third grade, must build on the gains acquired by a child in preschool. As noted by the authors, since the children in this study are from impoverished families, these children are also likely to have attended elementary schools where the rate of poverty is high. Elementary schools in high poverty areas are often struggling. Therefore, the study is simply making us realize that a good quality preschool is not a cure for a poor quality elementary school. With a good preschool, children from poor families are provided learning opportunities that are not possible in their homes. This difference in learning opportunities, however, exists beyond preschool so it is important that efforts are sustained throughout the elementary years and not just in preschool. The early years of education are indeed critical. These years truly need our careful and thoughtful attention especially for students with needs. What Do Those Slippers Really Mean? Are We Teaching Poor Children Less Math? How Much Screen Time Is Appropriate for Children?